Want to give your MightyOhm Geiger Counter Kit a little more sparkle? Replace the ordinary indicator that comes with the kit with something special – a superbright LED! 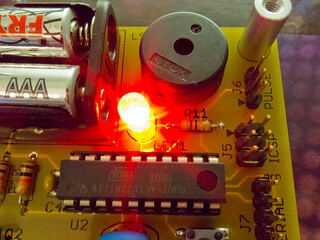 Superbright LEDs are available from most common electronics distributors, such as Jameco, Digikey, Mouser, etc. But instead of spending hours trying to find the LED you want in a catalog, I highly recommend ordering your LEDs from Evil Mad Science. EMSL sells curiously bright LEDs organized by color. I recommend their “5mm, Clear lens” LEDs in red, green, or blue. You’ll also need a new dropping resistor R11 to go along with your LED choice. Some values of R11 for various LED colors are given below. If you see “0 Ohms” listed, you can either use an actual zero ohm resistor (yes, they exist), or a short piece of wire. Resistors are available anywhere electronic components are sold – I recommend a quick trip to Radio Shack. You might have to buy an assortment of resistors to get the value you want, but that’s not so bad – having lots of resistors around is always a good thing! Desolder the LED and resistor R11. To do this, you’ll need desoldering braid (available at any electronics store), and maybe a desoldering pump/solder-sucker. If you have a fancy desoldering tool you should probably use it, it will make your life much easier. Make sure to switch off and remove the AA batteries from your kit before you start removing components. 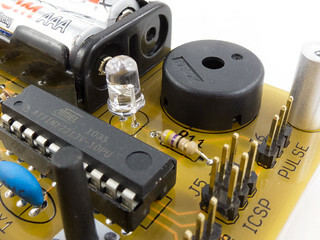 You can desolder the LED by heating the legs with your soldering iron and pulling on the LED gently with a pair of needle-nose pliers in a back-and-forth motion. Or, clip the leads under the LED, heat each one with your soldering iron, and pull it out of the PCB. R11 can be removed in a similar fashion. 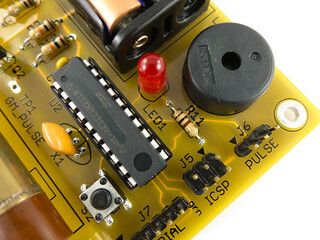 After you have removed the components, use the desoldering braid or solder-sucker to clean out the holes in the PCB. You want the holes to be completely free of solder so that you can insert the new LED and resistor. Simply insert the new resistor and LED into the holes in the PCB and solder the terminals. Make sure the flat spot on the side of the LED lines up with the silkscreen markings on the PCB. Also, the longer lead should go into the hole marked +. The resistor can go in either way. Clip off the excess leads (watch your eyes), and you’re done. Step 4: Behold your pimped geiger counter! Place the AA batteries back into the battery holder, turn on the power switch, and behold your pimped geiger counter! Disclaimer: This modification will no doubt reduce your battery life, and the blue LED in particular will decrease in brightness quickly as the batteries drain (3V is barely enough to light up an ultra-bright blue LED). You might also attract unwanted attention when you use the kit, particularly in a dark environment, but if more attention is what you want (isn’t this why you pimped it out in the first place? ), hack away! Now that I think about it, it makes perfect sense. There is basically never a case where two normal AA batteries in series will provide more than 3V… It’s as simple as matching that assumed maximum voltage to the point on the provided curve for a given PN chemistry, and confirming that, yup, that’s safe, and running with it. Even though the curve gets pretty steep in the active region, there is still many mV of leeway with respect to the “safe” current. I guess I never thought much beyond “Eek! No resistor?” until I put it in writing. That’s correct. Another thing you’re neglecting is that the AVR has some internal resistance, and this will serve to further flatten the IV curve. It’s not the most elegant solution but in practice using a zero ohm resistor works just fine. I ran into a similar situation when making a ring light for a microscope. I’d chosen a series/parallel combination of white LEDs and was using a regulated 9v wall wart as a supply. Long story not as long, the “best” combination (don’t remember the specific arrangement) resulted in using no dropper resistor as in your post, with a totally reasonable If (again, don’t remember the specific value). In my case, I got nervous and scrapped the arrangement as I feared that, though it looked and measured okay, I was breaking a (maybe nonexistent) rule and my LEDs would fail prematurely. You know why they exist, don’t you?